Tips for flowers on a hot southern patio? I'm new to these forums but it looks like a great place to get help. This year I started a container garden on my patio. I live in north Texas where the summers are notoriously hot. Some of my flowers are doing very well and some are not. I'll provide some details about the patio and my plants and maybe someone can give me some tips? The patio face West and gets direct sunlight from about 3pm to sunset (around 9). The temperatures often reach 104 degrees in the afternoon. There is a table on the southern end of the patio that is shaded and gets filtered sunlight during that time. All of my pots have drain holes in them with trays underneath. I water every other day or when the soil is dry a finger length below the surface. The window box is coconut hair and gets watered daily. I drain the trays about an hour after watering the pots. Vincas: I have two pots of Vincas that stay on the table and get sunlight filtered through the shade. They are doing very well. Petunias: I have some in a hanging basket, some in a pot, and some in a planter box made of coconut hair. I grew the ones in the planter box from seeds and they're doing VERY well. The hanging basket is okay, and the ones in the pot are doing... okay. I have some brown leaves and areas that look a little wilted. It looks like some sort of fungus may be getting to those. Portulacas: I have some purple portulacas in a large pot sitting on a stand. The plant itself is lush and green but there are very few flowers. Maybe one or two at a time and they fade quickly. I just bought several plants of a different variety that I potted today. I'll see how well they do. I may have fertilized the former portulacas too much as I've read that inhibits flower growth. Zinnias: I just spent $10 on new zinnias, planted them in pots, watered them well, drained them, and set them on the rail in the sun. The next day, 4 out of the 5 plants were fried. Brown and crispy. These are supposed to be heat tolerant! What happened? Stargazer Lilly: There bulbs planted in a pot on the table. Growing very slowly but appear healthy. One or two leaves with a brown spot. Not anywhere close to blooming and they've been out there for 3 months. I had spider mites that killed some of my begonias. I sprayed with an insecticide that the local nursery suggested. It killed some of the flowers I sprayed it on but I seem to have control of the mites. I washed all of the pots from the dead plants with dish soap before using them again. Any suggestions on why some plants aren't doing well? The zinnias, no matter how heat tolerant, probably should have been placed in the semi-shaded area first, then moved into full sun over a period of a week or so. They might not yet have been acclimated to sun and heat of the same intensity as on your patio. On very hot days, I hose down the patio itself a couple times, to increase the humidity around the plants. The evaporation of the water also reduces the temperature of the air a bit. Kisal wrote: The zinnias, no matter how heat tolerant, probably should have been placed in the semi-shaded area first, then moved into full sun over a period of a week or so. They might not yet have been acclimated to sun and heat of the same intensity as on your patio. Thanks! I vaguely remember something about having to allow plants to become acclimated after purchasing and potting them. 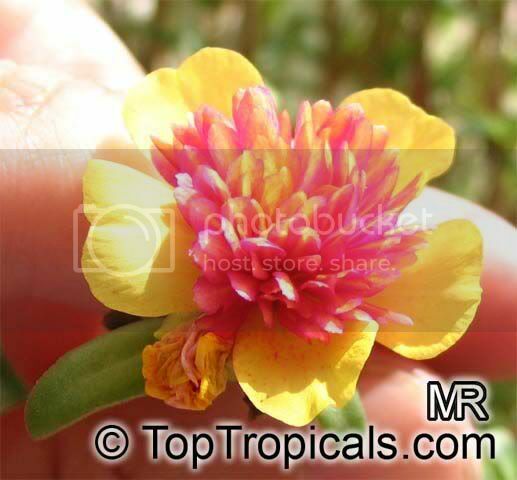 I'm looking for Portulaca grandiflora 'All Aglow'. I can't find it anywhere, even online. The two places I saw it advertised ... both in FL ... don't have any in stock. Have you by any chance seen it in your area? I'd love to buy some, if I could just find it. JGGRN, let's re-rail your thread. Begonia are most definitely part-shade type plants and if you want flowers you need to make sure they get that shade.... This comes from experience growing them in much higher heat than even you get. For full, punishing sun, check out Osteospermum and Gazania (the African Daisies), Buttonflowers (Scabiosa), and Lupines. All will do excellently in pots, and all are tolerant of quite high heat and UV. It's also really hard to drown these plants. Next time you have spider-mites, try using a solution of castille soap in water, or look for Safer's Insecticidal Soap. These are much gentler ways to rid yourself of mites, and won't kill your plants. Spray in the evening after the sun has left the plants to avoid sunburning them. lorax wrote: JGGRN, let's re-rail your thread. That's very helpful! Thanks a lot! I was using soap spray before but I think the damage to the plants occurred because I did it during the day and the plants got sunburned. All of my succulents (agaves, kalanchoes, a couple sedums, aloe) verbenas, purple fountain grass, ipomoeas (sweet potato vine), all of my herbs, agastaches, cuphea, a couple salvias, & new zealand flax all prospering. I haven't done anything special except for watering twice a week instead of once. I had to relocate some gerbers, a california poppy, a few types of penstemon, and a coleus. Like kisal said, the most important thing is to introduce them gradually to the harsh conditions, over the period of a week or so. You can do this by keeping them in their nursery pots and moving them back and forth before planting them in their new containers. Ideas for Apartment Patio Garden?